14 of us were out today, enjoying a sunny but cool ride. John led us on the way out on an unexpectedly circuitous route which included the lesser known housing estates of Knutsford. For the last few miles Martin made a tactical move to the front, partly to prevent any more miles being added in, and partly as positioning for the cafe queue. We arrived at the cafe just on 12, ahead of mother's day groups, but behind several other groups of cyclists, including a pair on a George Longstaff tandem which had been converted to an e tandem. Fortunately the cafe is used to large numbers of cyclists and there were still plenty of seats. The food was good value, great choice, big portions...no wonder it attracts lots of cyclists! We split into two groups on the way back, with Martin and I taking a shorter route with Gawsworth John and Phil K. John led the main group, made up of Alicia, Bibet, Gwen, Kirsten, Sue, Griff, Jim, Phil B and Paul R on a merry dance through Goostrey, arriving back half an hour after us but with an extra 8 miles completed (34 miles total). 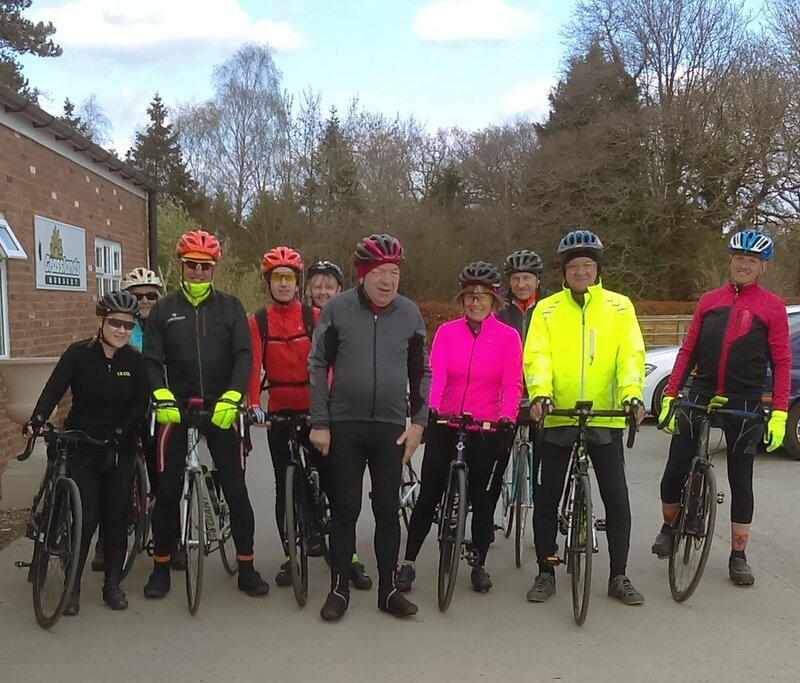 A number of the group decided to celebrate a good ride with a few more miles and a second cafe stop in Alderley Edge for hot chocolate! Some of us will be in Majorca next Sunday, so Paul R has volunteered to lead an easy ride from Broken Cross, destination will be decided on the day.